I am a dad to two amazing girls. They bring so much joy to my life. They also bring a certain amount of stress! My oldest is on the cusp of her teenage years, and my youngest is only 9. I have my worries about how their life will turn out, but my wife and I do our best to put them on the best path. 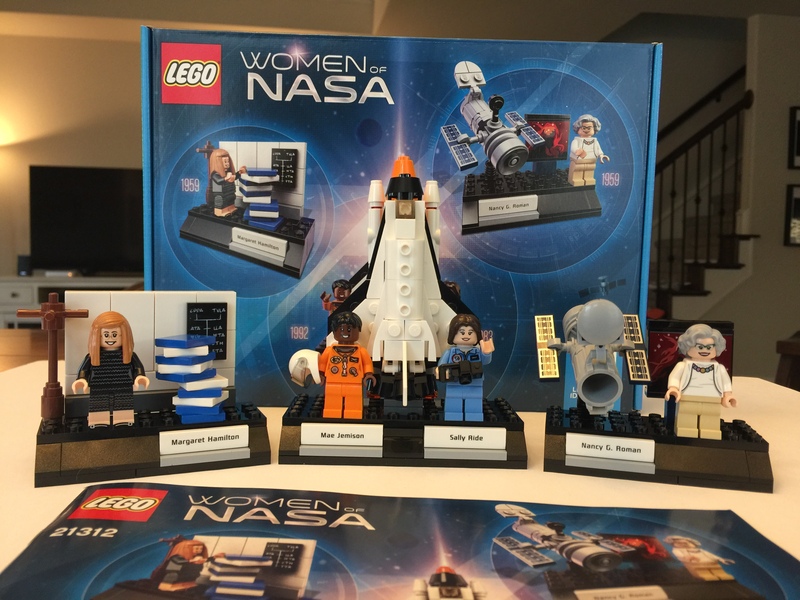 When I saw that the Women of NASA set from LEGO® Ideas had been approved, I was excited! When the LEGO® Ideas Research Institute came out, we managed to find one set. My wife and daughters each took a vignette and a minifigure. I was left out, but that’s okay! Seeing the excitement from my girls was enough. 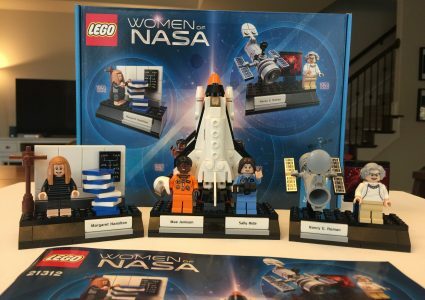 The Women of NASA set took the idea of women in STEM in a different direction by honoring specific women, not just roles. I love the idea of space travel. Star Wars and Star Trek have always been some of my favorite movies and tv shows. As a kid, I also remember watching my first shuttle launch, and as an adult, my first trip to Johnson Space Center to see the Saturn V. Seeing the Space Shuttle Endeavour in person was such an awesome experience as well. On launch day, I couldn’t wait, so I ordered my set from Amazon and got same day shipping. I put the set together with my youngest daughter, who is also fascinated with all things space! She wanted to build the Space Shuttle, so I took the other two vignettes. First, let me talk a bit about the packaging. Normally a box isn’t much to talk about, but with Ideas, it is part of the experience. The front displays the set well, and is just visually beautiful. 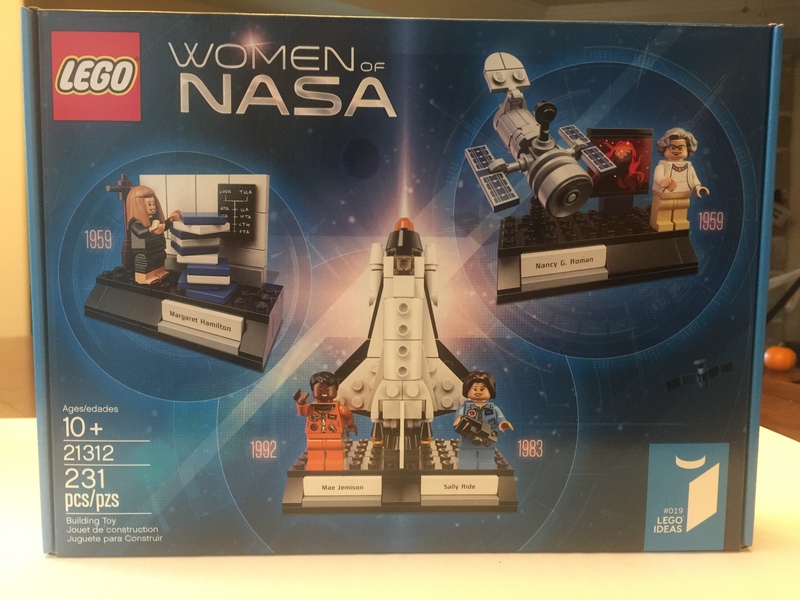 The back of the box shows the four women honored in this set, not only in minifigure form, but also pictures. This helps remind us that these women actually existed, and aren’t just characters or toys. 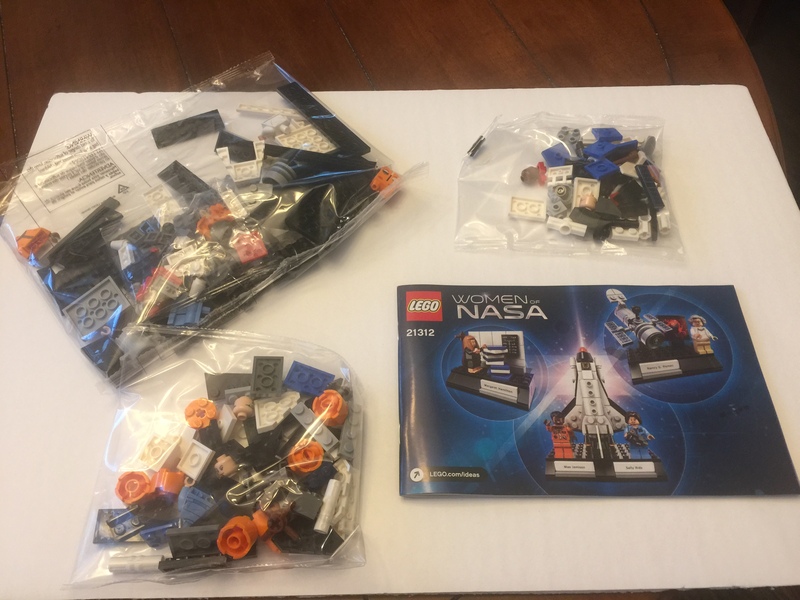 Inside the box we find three bags with parts (none of which are numbered), and another awesome thing that LEGO® does for Ideas, the instructions! This is more than just building instructions, it talks about the set designer, and in the case of historical sets like this, the people. It was fun reading this with my daughter, talking about each of their roles and the challenges it takes to get there. The builds are pretty straight forward, nothing stood out during the process for the two vignettes I built. My daughter never asked for help, so the Space Shuttle was simple as well. I will note that as with other sets, no stickers! 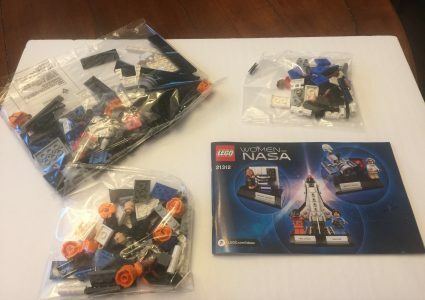 I really wish LEGO® would do away with stickers in all sets, but that is a rant for another day. Let’s talk about the finished product. First, we see Margaret Hamilton, mathematical genius. Hamilton led the team that developed the on-board software for the command and lunar modules that helped make the Apollo project a success, and landed the first men on the moon. The minifigure captures Hamilton very well. The torso is printed front and back, and the legs are printed to show she is wearing a skirt, and black shoes. The hair piece is designed to show her long hair pulled back from her face, but still falling over the shoulders. The head is printed front and back, showing off a small grin or huge smile. And just like the real Hamilton, the minifigure is wearing glasses. The set is simple, a wall with a blackboard, stack of books depicting the books for the Apollo software, and a coat rack. The set captures Margaret Hamilton and her contributions to space flight very well! The next vignette to talk about is the Space Shuttle with Mae Jemison and Sally Ride. Ride was America’s first woman in space. She flew aboard the Space Shuttler Challenger in 1983 on STS-7 , and again in 1984 on STS-41-G. Sally Ride broke that barrier and became an inspiration for girls aspiring to become astronauts. Ride’s minifigure counterpart shows Ride in a blue jumpsuit which astronauts typically wear while in space. The torso is printed on the front and back, and shows her nametag, as well as the mission patch for STS-7. The legs are just the same blue. Her head is printed front and back, showing her smiling, or, what I think looks like her concentrating. Her hair piece matches what we see in photos, and she also carries a camera. Mae Jemison was the first black woman in space. After Sally Ride’s first flight, Jemison felt that the astronaut program had loosened up, so she applied, and was accepted into the Astronaut program. She flew aboard the Space Shuttle Endeavor as a mission specialist for STS-47. Jemison’s minifigure depicts her in the Advanced Crew Escape Suit, the orange flight suit worn at take off and landing. The torso is printed front and back, a zipper on the back. On the front we see the STS-47 mission patch, her name tag, and the various suit safety features (such as locking rings for the helmet and oxygen connector). Her legs are just orange, nothing notable about those. 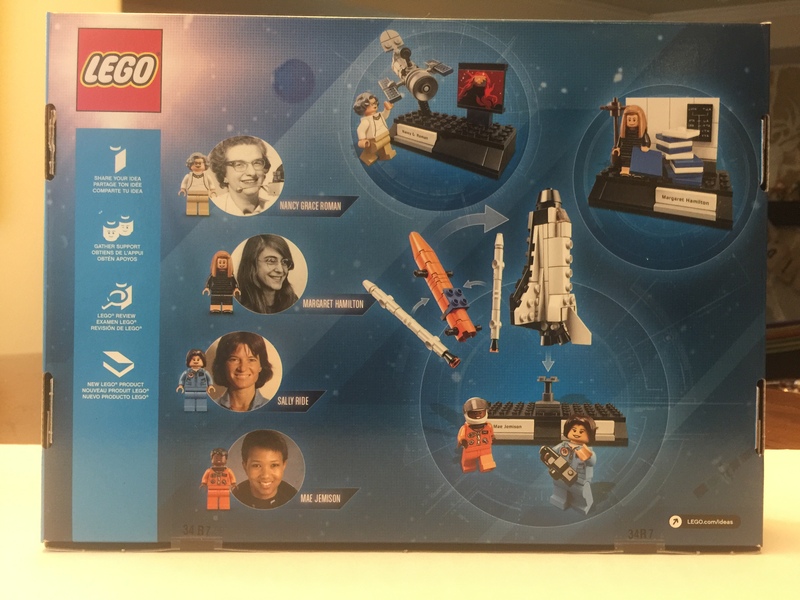 Her head is printed front and back, with the same smile/concentration combo as Sally Ride’s minifigure. The hair piece doesn’t quite match as well as photos, but it passes. Jemison’s figure also comes with her flight helmet, so she is ready for takeoff! Both minifigures are displayed in front of a micro-version of a space shuttle, that is setup in launch configuration. As part of a play function, you can remove both booster rockets, as well as the external fuel tank. The space shuttle was captured well in this small build, and is a great addition to this set. Finally we have Nancy Grace Roman. Roman’s interest in space exploration started when she was 11 and formed an astronomy club at school. She went on to study astronomy as an adult, where she became the first woman to hold an executive position at NASA. During her career at NASA, Roman was involved in developing and launching numerous satellites. She is known as the “Mother of Hubble,” for her work in the planning of the Hubble Space Telescope. Roman’s minifigure has tan legs. Her torso is printed front and back, looking as if she is wearing a sweater and necklace. Her face is also printed front and back, with a smile and a grin. She is wearing green cat-eye/horn-rimmed glasses. I think my favorite part is the hair piece, it captures the 1950/60s so well! Roman stands next to the brick-built Hubble Space Telescope, and in front of a photo taken by the Hubble. It is a great use of a lego re-purposed trash can as the main structure of the Hubble. Very creative, and well done! Each vignette will join some part of my displays, two with other Ideas/Cuusoo sets! Margaret Hamilton with the Saturn V. Nancy G. Roman will sit next to the Hayabusa spacecraft. 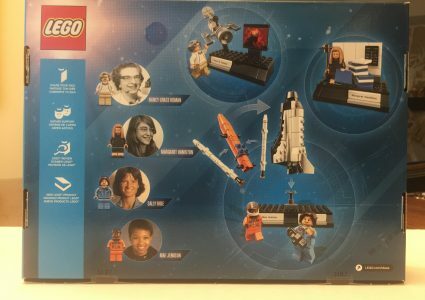 Mae Jemison and Sally Ride will stand in front of the LEGO® Space Shuttle Expedition! 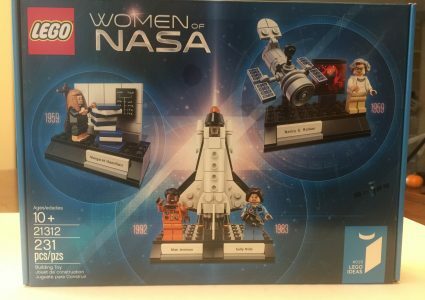 If you’re a fan of space exploration, have daughters, or, like me, both, grab yourself a set before they sell out!